BREAKING. Major Egoli broadcast problem! You're reading it here first. Complaints immediately started flooding in and people went crazy wanting to know from me what is going on with tonight's episode of Egoli on M-Net. Firstly - big gap in the episode that went out at 18:30. On Thursday Stephen Edwards still asked Jansie to marry him and go to Switzerland. In tonight's episode they were already married, and back and speaking of getting hitched in PAST tense. So, a BIG GAP between the episodes. Who knows whether it's one or a multiple episodes that the soapie skipped into the future? Then there were the unending technical problems that plagued the episode from beginning to end and made viewers furious! The episode was much shorter in story time that usual - about 15 minutes only of the 22 episode length. Ad breaks stopped and started at random right through. Ads happened without the Egoli title card that indicated the start and end of commercial breaks. One ad for Castle Light for instance started playing while Egoli was on, meaning that you could see BOTH the conversation between characters AND the ad superimposed on each other. Then you saw the white letters on black background cards flashing at random throughout the whole episode with the words ''Commercial One'', ''Commercial Two'', ''Commercial Three'' and so on right through the show. I immediately started tracking down M-Net people to get answers and find out what went wrong. As of yet, M-Net has no idea what went wrong. Programming note: Catch me on TV this morning. Programming note: I will be live on the eNews Channel (DStv 403) just after 07:30 this morning on Morning News Today as pop culture expert, hopefully talking about some interesting things. PS: I'm jetting off to the Channel O Music Video Awards 2009 later today which is happening this evening in Johannesburg. Check back for goss you KNOW you'll only read here, some red carpet pics (and more goss) and all the info from the award ceremony right after it's happened. BREAKING. Programming alert. Catch me on TV just after 15:00 TODAY. Programming note: I will be on the eNews Channel (DStv 403) just after 15:00 TODAY to share my insight as popular culture expert. I was there at 02:00 this morning at Cavendish in Cape Town for the global premiere of Michael Jackson's THIS IS IT that opens for a limited run of two weeks today. BREAKING. JOKE OF THE YEAR! SABC wins award for . . . BEST REPUTATION. Suspended commissioning of local content. Check. What can you possibly give the SABC for this wonderful, untarnished, unblemished and simply BRILLIANT modus operandi? How about a bronze award for BEST REPUTATION???????????? I kid you not. IN WHAT IS SURELY THE ABSOLUTE BIGGEST JOKE OF THE YEAR, the SABC has been awarded a bronze award for best reputation. The South African public broadcaster has been given a bronze in the community category for BEST REPUTATION at this year's Public Sector Excellence Awards held in Sandton. The SABC also received a certificate for its ''high awareness level'' amongst South Africans. I wonder: high awareness of WHAT exactly . . .? ''[The award] clearly states that the communities out there are aware of the service that the public broadcaster provides and they appreciate what we are doing,'' says Gab Mampone, the SABC's acting group chief executive officer. What other AWARDS COULD THE SABC POSSIBLY BE WINNING NEXT? How about the Proudly South African Award for supporting local content? The Snuki Zikalala Award for International News coverage? The Amagluglu Award for special recognition for corporate petrol cards use that goes above and truly beyond duty? BREAKING. 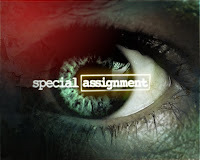 SABC3's Special Assignment wins international award. You're reading it here first. First lie-detector tests, now bragging rights. The SABC which ordered lie detector tests on its own people working on its own investigate journalism magazine show Special Assignment (after material for the haven't-yet-might-never-air episode looking at satirist Zapiro was leaked to The Mail & Guardian), now wants to brag with the show. Johann Abrahams, executive producer of Special Assignment and investigator Godknows Nare have won a Special Prize Television award in the Lorenzo Natali awards held in Stockholm, Sweden. Their winning entry was the documentary, ''Hell Hole'', which exposed the horrors of Zimbabwean prisons which aired on Special Assignment early this year. The global Lorenzo Natali Prize rewards journalists committed to human rights and democracy. This year they received more than a thousand entries. BREAKING. South Africa get's The Vampire Diaries. And only I can tell you where you'll be able to watch it- and when . . .
You're reading it here first. I was first to tell you that M-Net snagged the year's best new TV shows, Glee and FlashForward andthat M-Net Action will have the new Stargate: Universe early in the new year, and here I'm spilling everything about number four: The Vampire Diaries. Vuzu (DStv 123) has secured the broadcasting rights to The Vampire Diaries and it will start on the channel in February. That means that it will still be just over halfway in its first season of 22 episodes when South Africa gets to see it. I've already watched the first 6 that has gone out in America and its delicious. QUICK CRIB NOTE: The Vampire Diaries is based on the book series by L.J. Smith. 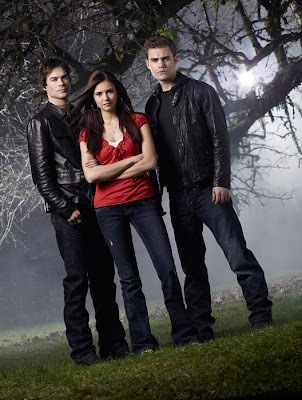 It stars Ian Somerhalder as Damon Salvatore, Nina Dobrev as Elena Gilbert and Paul Wesley as Stefan Salvatore. Basically the two brothers are both vampires, Elena is caught in the middle, and Damon is BAD and Stefan is GOOD. Of course the vamp bro's are centuries old, but Elana is still in high school so The Vampire Diaries is a broody, delicious primetime teen soapie you'll love! BREAKING. 'This Is It' red carpet premiere shown on Vuzu. I can be first to tell you to get ready to stay up late or set the VCR or PVR. Vuzu (DStv 123) got the rights to broadcast the red carpet premiere of Michael Jackson's Michael Jackson - This Is It movie premiere on Wednesday morning, 28 October from 01:45 to 02:45. 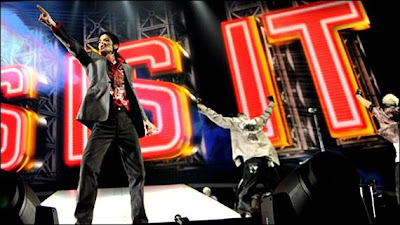 Michael Jackson - This Is It is a movie montage celebration, culled from the more than 100 hours of video footage of the live rehearsals just before the singer's death for his upcoming British tour. He would have performed in Londen's O2 Arena. Vuzu also brings fans an EXCLUSIVE screening of Michael Jackson - This Is It on Friday, 30 October at the Cresta Mall in Johannesburg and the youth channel has 5 double tickets to give away as prizes. To win one of these 5 double tickets you have to go and create a Vuzu profile on the website here, upload your moonwalk (or basically just your best MJ moves, or a photo of you as the ''the gloved one'' aka in any MJ gear). Then send an email to competitions@vuzu.tv with your usename and profile link to let the channel know that you've entered. The winners will be announced on Monday (26 Oct) on Vuzu's official website and on the daily Vuzu entertainment showbiz roundup show, V Entertainment. In other related news of course, Michael Jackson - This Is It has also passed the 180 000 mark for TICKET PRE SALES in South Africa, breaking the record for the movie with most advanced tickets sold in South Africa . . . EVER. On Wednesday morning at 02:00 I will be at the exclusive worldwide premiere event with Ster-Kinekor joining in the global release of the movie. Ster-Kinekor is joining the global event with 02:00 screenings at SK Fourways in Johannesburg, SK Gateway in Durban, Cavendish in Cape Town (where I will be) and SK Sterland in Pretoria. After the official premiere, the movie will be on circuit for a 2 week limited release (normal times and ticket prices apply. Ster-Kinekor will also be putting up a special, what they call ''Celebratory Wall'' at selected cinemas. This will celebrate the King of Pop's life and work. Moviegoers will be able to write personal messages that will be collected by Ster-Kinekor for a bound album to be sent to the Jackson family in acknowledgement of the contributions he made to Africa. UPDATE 11:40 - I just got word that the DStv sister channels, Channel O (DStv 320) and mk (DStv 324) will also be carrying the red carpet premiere live at the same time as Vuzu (DStv 123). BREAKING. Toldya! Oprah here in November for O Magazine. ONLY 460 places. Here's how you can get to see her! You're reading it here first. On Saturday I was first to break the news although nobody wanted to speak, about Oprah Winfrey's visit to South Africa in November. Oprah Winfrey's visit with readers will be called the ''You Have the Power'' event. It will take place on 30 November in Johannesburg and will be moderated by O, The Oprah Magazine editor Samantha Page. ''This is the second time our readers will have the opportunity to be in the company of one of the most infuential women in the world,'' says Samantha. Readers of O, The Oprah Magazine must buy the November issue on sale now for a unique number printed on the inside. Tickets for the event will be available from 09:00 on Monday 2 November and will be limited to TWO PER PERSON from Computicket. When you buy a ticket, you ahve to quote the unique number found on PAGE 17 of this November issue of O Magazine. Tickets will be R750 per person. Expensive. Then again, you get to see Oprah. Live. And everyone gets a car. Everyone gets a gift bag, a 6 month subscription to O Magazine, a breakfast and of course an audience with Ms O.
Freshlyground will provide the music entertainment on the day. You're reading it here first. Yesterday afternoon I was first to spill about kykNET's birthday plans. kykNET turns a decade old in November (how time flies), that includes new on-air imaging and a refreshed look. Just after 19:00 the channel issued a press release with all the juicy goodies viewers can look forward to. On 15 November the Afrikaans satellite channel is partying up a storm with a special documentary programme charting the course of the channel over the past 10 years from 1999 to today. Piano man Rocco de Villiers who composed the first and original theme music for the channel will bring out the piano with Robert Mitchley on guitar in a musical journey. On 22 November Fiesta will visit the fun and festivities of the party kykNET is having to celebrate the decade's achievement. On 28 November kykNET's channel head, Karen Meiring will be in the Glitterati studio to talk about the channel's plans for next year. Viewers can also get ready to see SEVERAL ''old'' faces when some of the previous continuity presenters drops by. Also every Sunday in November kykNET is turning back the clock by rebroadcasting some of the very first shows on the channel that were immediate hits with viewers. November also sees the start of 3 brand-new shows on kykNET. * On 22 November Kyk hoe lyk ons nou (4 episodes) starts with Chris Chameleon as presenter, looking at the Afrikaans community. * Landbousake starts on 3 November and will go out every Tuesday and Thursday morning at 06:30 looking at agriculture affairs. *On 28 November Reik na die Sterre starts in which some of South Africa's top musical talent will entertain viewers in a variety of musical styles. ''It's ten years later and we're entering a brand-new phase,'' says kykNET channel head Karen Meiring. Where the 3rd season of 'Survivor SA' will take place . . .
M-Net's third season for Survivor SA is due to start filming in just a few weeks from now (in November) and although the pay channel is super tightlipped about where it will be shot, some idle M-Net island gossips and TV production types whispered a few things to me. Now I can be first to tell. Well, sortof. ''at an exotic, but desolate, location in the Indian Ocean''. Like the kid in Lorenzo's Oil I'm going crazy to tell but won't, so get on your Marks and guess away people! BREAKING. kykNET turns 10 with a NEW LOOK. You're reading it here first. The Afrikaans satellite channel kykNET turns 10 next month, and I can be first to let slip that the channel is changing. Not too much, just - as a special birthday present to viewers - a new updated logo and on-air imaging, basically a refreshed look for the channel celebrating turning a decade old officially. Also viewers can get ready for special birthday programming, with kykNET's local shows - ranging from music to magazine shows - tying in with kykNET's birthday theme. As soon as I get any word on any specific birthday plans, shows and special programming, you'll read it here. Viewers will be able to catch the introduction of the new look and feel and kykNET imaging from November, with a roll-out of the special celebratory programming continuing during the whole month of November. Jubie Matlou, Icasa spokesperson calls the meeting (of two hours where Icasa chairperson Paris Mashile was present) . . . ''frank''. Icasa is working on a new blueprint document, referred to as the new Compliance Manual for all South African broadcasters. This manual will detail how, and track how, they should comply with their licence terms and conditions. It will be published in the next two weeks or so. Icasa also plans to release the SABC's 2008/2009 Compliance Report - which should make for very interesting reading. Icasa is also readying the final Digital Terrestrial Television (DTT) regulations which Icasa will also publish in the next few weeks. The regulator also has a detailed DTT market study which will help with the review of existing local TV content regulations. According to Icasa the last local TV content regulations was set and published in 2003. BREAKING. TVIEC accuses Icasa of insufficient monitoring of the SABC. You're reading it here first. I just got the first feedback from the TV Industry Emergency Coalition (TVIEC) who met today with the Independent Communication Authority of South Africa (Icasa). The TVIEC had a 2 hour meeting with Icasa who is supposed to check and monitor TV channel's local content quotas. The TVIEC says - especially in light of the SABC's drastic cutback on local content commissions - that Icasa is basically not checking and monitoring the SABC's compliance reports related to local content broadcasting correctly. ''The TVIEC is alarmed at the lack of rigid monitoring of SABC compliance admitted by Icasa in the meeting,'' says the TVIEC. BREAKING. 'Absolute Woman' with Melanie Bala. You're reading it here first. I can be first to tell you that Melanie Bala's new local talk show will be titled. . . Absolute Woman. Of course I was first last month with this story breaking the news that Ms M is busy with her own talk show for the M-Net Series channel. I can now also tell you that Absolute Woman will start in January on M-Net Series. The show will center around female drive topics, as I've already said, with a studio audience. It will be M-Net Series' very first locally produced talk show. Also, this brand-new publicity pic of Melanie Bala, you're also seeing here . . . FIRST. BREAKING. 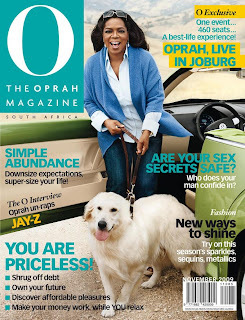 Oprah Winfrey back in South Africa in November for another 'Best Life' visit. You're reading it here first. I can be first to break the news that Oprah Winfrey will be back in South Africa in November again for a slightly longer stay and for speaking with women again and sharing some personal life wisdom in another ''Best Life''-seminar in Johannesburg. This time she will be staying for a bit longer than the usual quick dash to visit her school, the Oprah Winfrey Leadership Academy for Girls outside Henley-on-Klip, that is usually also kept as quiet as possible. I've learned that Oprah will be here again next month, although nobody wanted to officially confirm her visit. She will be doing a Best Life seminar again, similar to the one in June 2005. However, there's only 460 seats available which should create the usual stampede for a seat to this ''rockstar event for women'' - my words - judging by what i saw when i attended the one in June 2005. 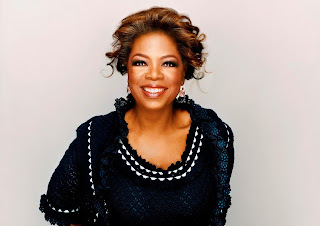 Oprah will once again talk to South African woman and share her wisdom, also visit her school and meet with the people of the local version of her magazine, O, The Oprah Magazine at Associated Magazines. A meeting with readers of O, The Oprah Magazine is not excluded and also a possibility. Associated Magazines didn't have any comment owhen I asked them, and didn't want to confirm anything. Furthermore its completely BUZZING in local advertising circles about another rumoured event where Oprah will apparently talk to and meet local ad execs - but catch! - they will all be women. Only female advertising people from the industry will be invited to this one. Harpo, Oprah's production company was also less than forthcoming when I approached them with what I know and asked for confirmation. ''There's nothing to announce at this time,'' was the response from a spokesperson at Harpo. All I can say is check the cover of the November issue of O, The Oprah Magazine and buy it if you want to attend the Best Life-seminar. The November issue of O, The Oprah Magazine should be on sale soon. BREAKING. SABC's 2009 MetroFM Awards cancelled. Guess why? It's not what you think . . .
You're reading it here first. There will be no 2009 MetroFM Awards this year. The SABC just ''postponed'' it to 2010. Which would make it the 2010 MetroFM Awards. But the SABC doesn't like the word ''cancelled''. Well, the SABC is struggling with money, but it's not their fault . . . entirely. The main sponsor is the the City of Tswane who withdrew as a sponsor and took the bulk of the funding for the event with it. MetroFM station management had no option but to cancel this year's award ceremony which was supposed to happen next month. MetroFM is currently in negotiation with other potential partners to stage the event early next year. BREAKING. CNBC Africa launches new show titled 'Media & Money'. You're reading it here first. The business channel CNBC Africa (DStv 410) is starting a brand new local show titled Media & Money on Wednesdays at 17:30. The presenters are Jacqui Nel and Mandlakazi Mpahlwa-Sigcawu. Media & Money will look at the business side of the media sector. The channel makes big promises with the show, promising to spill the inside goss on the stuff discussed behind agency doors, a look at the latest marketing campaigns and that Media & Money will feature ''the biggest names in marketing, advertising, media and branding''. ''Media & Money will tackle all of the topics that are relevant and important in the media and advertising industry at the moment,'' says Jill de Villiers, CNBC Africa head of programming. One of the first guest hosts will be Gordon Patterson, managing director of Starcom. Media & Money will go up against Jeremy Maggs who also does a locally produced media and marketing show, Maggs on Media for the eNews Channel (DStv 403) on Sunday mornings at 10:30 and multiple repeats during the week. Maggs on Media has been running for the past year and four months. I just got an episode specific program synopsis for this Wednesday's episode. Andy Rice is the guest host. Tholoana Qhobela, the new strategy director at The Jupiter Drawing Room discusses issues surrounding the advertising industry. Media & Money has highlights from The Loerie Awards held in Cape Town, and the show takes a look at Allan Gray's latest campaign. Is that really James Dean . . .? You're reading it here first. The TV Industry Emergency Coalition (TVIEC) will be meeting with the TV regulator Icasa on Monday. The industry pressure group will be meeting with the South African communications regulator this Monday, 19 October at 11:00. The TVIEC was formed earlier this year after the SABC's shoddy payment system collapsed because of the public broadcaster's growing debt problems. The TVIEC will be meeting with Icasa to discuss a range of issues, but particularly to get more clarity from Icasa on the regulator's monitoring practices regarding the amount and type of local content on the SABC. ''The crisis at the SABC has resulted in an unprecedented commissioning freeze. With a mass of repeats on air and precious few new shows in the pipeline, the TVIEC is questioning how the broadcaster hopes to meet its local content mandates – and what Icasa is doing to monitor the situation,'' says the TVIEC. BREAKING. Michelle and Riaan Garforth-Venter's new TV project: building an eco friendly home! You're reading it here first. She's pregnant, he's the father, but they're making more than just a baby. They're building a new eco-tastic house! South Africa's eco-couple Michelle and Riaan Garforth-Venter has a brand-new show in the works, Love & Mortar that will start on The Home Channel (DStv 182) on Tuesday, 12 January at 19:30. This 30 part half hour reality/documentary show will follow the two in their quest to build their ultimate green home. In a South African television FIRST, the couple will allow viewers into their lives, revealing how they juggle their busy careers and schedules with the daunting task of building and furnishing their first bio-climatic family home. Love & Mortar is produced by Setsebi Productions. 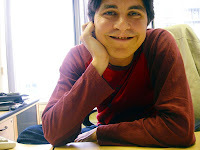 Riaan is known from his DIY skein DIY with Riaan on SABC2 and Michelle did Bush Radar and Wild Ltd. also for SABC2. You're reading it here first. The SABC has suspended four high flying execs at the public broadcaster with immediate effect. All four have been suspended pending the outcome of internal disciplinary processes arising from investigations conducted by the office of the Auditor General (AG) and other parties. SABC Interim Board yesterday suspended four members of the executive management, pending the outcome of internal disciplinary processes arising from investigations conducted by the Auditor General and other parties. The SABC says that their immediate suspension ''does not in any way imply that any conclusions have been reached on whether or not there has been any wrongdoing by any of the executives or other staff members''. Irene Charnley, chairperson of the SABC's interim board said the broadcaster is following due process. BREAKING. Renewed - Getroud met Rugby will kick off with a 2nd season. You're reading it here first. kykNET's rugby soapie drama Getroud met Rugby just finished on the Afrikaans satellite channel on DStv but I can be first with the news to confirm that Getroud met Rugby will definitely be back for more. kykNET has greenlit the production of a second season of Getroud met Rugby that will broadcast towards the middle of next year. The Footballers' Wives type show set in the local rugby world and revolving around four rugby couples and their scandals, was created and written by Deon Opperman. BREAKING. Mark is voted off the island! Sad. It wasn't necessary to count the votes, he just kinda got blindsided. Mark Bayly won't be the host of the third season of Survivor SA. With a new 3rd season of Survivor SA in the works that will be a celebrity driven version (the Famous running around on an exotic island in the Indian Ocean, filmed during November and December), Mark won't be there to snuff out any overinflated ego's and torches. It's sad. I've always liked him in that Jeff Probst-y role for our local version. Of course Mark has changed his muddy boots for some studio makeup and switched the khaki's for some tuxedo's as the co-host of the glam cam magazine show All Access. According to M-Net that now makes him basically persona non grata to go and hang around on the island. That is of course true of Tyra Banks hosting America's Next Top Model and her own Tyra show, both on the same channel. That is of course true of Ryan Seacrest hosting E! News daily as well as American Idol. That is of course true of Gareth Cliff talking on radio and TV in M-Net's very own Gareth Cliff Show at the very same time. And things probably changed since Shaleen Surtie Richards played Nenna in Egoli on M-Net and hosted her own talk show Shaleen on M-Net as well, and Zuraida Jardine fronted Big Brother and had her own show on M-Net's sister channel GO and on and on. SABC3 has no problem with having Jeannie D and Janez Vermeiren BOTH in Top Billing and Top Travel at the same time. Unsophisticated (South African) TV audiences get confused so easily these days. Luckily our TV channels are there to protect them. I really don't see a problem with an on-air talent doing double duty. When they're actually good at what they do and can fit it in, why not get more out of them? BREAKING. M-Net brings Survivor SA back - with a celebrity season! What i CANNOT say is that you're reading it here first. M-Net told me they'd leave me on a deserted island if I break the news before midnight. M-Net is bringing back Survivor South Africa (Survivor SA) for a third season of the international format that the pay channel adapted into a local series. Endemol SA will produce the 3rd season which will be a ''celebrity edition'' with local stars stranded on an exotic island in the Indian Ocean. (The previous two seasons took place in Panama and Malaysia). The channel will quickly sift through applicants (the Famous can now apply. The Famous can tell M-Net they want to enter by emailing M-Net - or getting your people to email their people - at celeb@mnet.co.za) and then film the latest island reality adventure in November and December to broadcast it very early next year. Some other BIG BIG BIG BIG BIG BIG BIG M-Net announcements also IMMINENT and COMING SOON (and totally NOT connected to Survivor SA) but as I said I have to keep the trap shut. For now. 1. Will Mark Bayly be available to host again and get time out from his presenting duties on M-Net glam cam show All Access? As soon as I know you'll read it here. ''All potential candidates will also have to undergo the Survivor medical and psychological tests," says Helen. Now Famous, get your people onto their people immediately. The Cape Town community TV station, Cape Town Television (CTV) is back on the air and broadcasting again after it had to shut down due to problems being able to pay its monthly Sentech transmission fees. ''We're delighted to be back on the air and we're going forward with renewed enthusiasm to bring Capetonians great programming that is relevant to their lives,'' says CTV station manager Karen Thorne. CTV is planning an on-air telethon on Thursday 29th October, where viewers, businesses and government will be asked to pledge donations for the channel’s transmission funds. BREAKING. CTV is off the air! CTV needs lots of moolla to start broadcasting again. BREAKING. M-Net has 'Farrah's Story'. You're reading it here first. M-Net has secured the rights to the Farrah Fawcett special, Farrah's Story. Shot with her own camera, starting (co-incidentally on the day she heard her cancer has returned), Farrah's Story details the two and a half year struggle of the Charlie's Angels star's battle again cancer. She passed away earlier this year. Her former Charlie's Angels costars, Jacklyn Smith and Kate Jackson also appears in this incredible ''video diary''. Farrah's Story will go out on M-Net on Saturday, 14 November at 22:00. BREAKING. New local Afrikaans TV channel starting. ASTV on the air from 2 November. Today I'm the very first to break the news of a brand new Afrikaans TV channel starting in November. Afrikaanse Satelliettelevisie (ASTV whose website is already up and running) will be free as a national TV channel across South Africa and plans to have its official broadcast launch on Monday 2 November. Although the channel's free, viewers will still need a DStv decoder to receive the signal, since ASTV will be broadcasting digitally and not in the analogue way the SABC does. Viewers will also have to retune their decoders to rescan for the new additional channel that has already started with test broadcasts. ASTV already has an impressive program line-up (the schedule is still under wraps), with several programmes ranging from talk shows, to lifestyle programmes, education shows. It's exactly a decade ago that kykNET started as an Afrikaans TV channel on DStv, and I spoke to Jaco Ferreira (disclaimer: no family relations), one of the directors of ASTV about the new venture. Jaco has been working in the local TV production industry for the past 14 years as director and producer and decided that the time is right to start something like ASTV. The beleaguered community TV station, Cape Town TV (CTV) that I was first to report has shut down due to money trouble , needs at least R550 000 from government to clear their debt and start broadcasting again. CTV's operational expenses is about R5 million a year and the TV station is unable to pay it's transmission costs to Sentech for the transmitter that it uses. CTV has a permanent staff of 16 people and 10 volunteers. I was first last month with the news that SABC2 is bringing back Police File, then again when SABC2 yanked the show on the day of its first broadcast after the national police commissioner was upset and ordered the show off the air to first give his input. Now it's back, and will start this Monday, 12 October on SABC2 at 18:00, but completely different in format, content and name. It will now be called When Duty Calls and is fronted by Tumi Golding. The first episode will feature an in depth story about a serial killer who committed suicide after being sentenced to several life terms. You're reading it here first. This morning I was first to break the news of actor Sello Maake ka Ncube joining the fight about the SABC's shoddy treatment of the local production industry by embarking on a hunger strike with The Hunger Protest (their excellent blog here) and now I have the most important quotes of what happened at 12:00 today at the press conference for you first. At this afternoon's press conference at Atlas Studios in Milpark, Johannesburg he confirmed that he has stopped eating in support of The Hunger Protest to show up the SABC's lack of transparency, ethics, respect, and other values. Sello, known for his roles as Archie Moroka in SABC1's Generations and in e.tv's soapie Scandal!, takes over from Zamambo Tshabalala (24) who ended her fast with a glass of diluted apple juice and spoke about why she did it. BREAKING. Sello Maake ka Ncube joins hunger striking action against SABC. You're reading it here first. I'm breaking the news here first, but in a few hours the Hunger Coalition (with their blog here) will make the dramatic announcement that the renowned actor SELLO MAAKE KA NCUBE has joined the hunger strike fight against the SABC. There is a press conference at 12:00 and later in the day I will bring you a wrap-up and update on what happened. The protest started almost two months ago now, when director/producer Michael Lee, stopped eating as a way to demand transparency and partnership from the SABC and especially to highlight the threatened slashing of local content. He reached a month before he started eating again. Michael handed over to six other protestors. Five stopped short of their original vows of 21 days, including the student producer and director of a documentary about the protest but some are going, new ones like Sello are joining and giving continuous momentum to their cause and keeping the spotlight on the SABC's local commissioning and budget cut woes. BREAKING. CTV is OFF THE AIR! TV station forced to cut its signal due to money trouble. You're reading it here first. Cape Town's community television station, Cape Town TV (CTV) is OFF THE AIR because of ''a cash flow crisis'' and the TV station's inability to continue to pay its transmission costs. CTV stopped broadcasting INDEFINITELY and will need at least R700 000 to start broadcasting again. CTV would need R150 000 immediately and R600 000 over the long term to cover transmission costs. CTV started its official broadcast on 1 September 2008 which means it remained on the air for exactly a year and a month. CTV cites ''a cash flow crisis'' that has forced the channel off the air and that it's unable to pay its transmission costs, although CTV management says in a statement they're ''confident that the situation will be resolved shortly, when the necessary funds have been raised''. CTV chairman, Martin Jansen says CTV ''has to pay normal commercial rates for its signal transmission to Sentech'' and laments the situation whereby community television stations like CTV don't receive a subsidy from government like community radio stations does. ''This means that CTV has to carry the entire cost of transmission, which is an onerous burden,'' he says. CTV's broadcast manager Mike Aldridge says CTV needs R150 000 immediately to get back on air and in the longer term, R600 000 is needed to cover the transmission costs. CTV currently broadcasts from just one transmitter, located on Tygerberg mountain. BREAKING. Deep trouble on Isidingo. . . and other drama! You're reading it here first. With sagging ratings the past year or so, the producers of Isidingo on SABC3, struggling to return the soapie to its glory days when it was somewhat of a competitor in the brutal timeslot of 18:30 on weekdays opposite e.tv's runaway success Rhythm City and SABC2's 7de Laan, is going all out in the remainder of the year with some CRAZY storylines promising a lot of trouble at The Deep. *Get ready for an accidental kidnapping! Barker in the streets, roaming like a wild man, searching, searching. . . . A random is demanded when Jody is kidnapped. *Parsons discovers he's sterile! ''There will BE NO BABY!'' screams Parsons in anguish and frustration. BREAKING. E.tv working on a new spinoff news channel for Africa, eNews Africa. You're reading it here first. I've known for months and today I'm breaking the news that e.tv, who already owns and runs the eNews Channel (DStv 403) is working on a new spinoff news channel for the rest of the continent, called eNews Africa. E.tv is planning a brand-new satellite news channel, similar to eNews, but that will cater to the rest of Africa, outside of South Africa. This comes as e.tv is setting up shop in Ghana by establishing a broadcasting studio there and as the SABC's interim board is seriously considering the SABC's languishing own money draining news operation, SABC News International. eNews Africa will in essence be a news service for the continent, although e.tv is still working out how the news will be delivered and what platform and shape it will take. 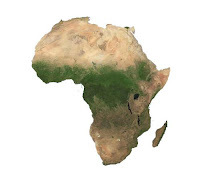 The aim is to provide Africa with as much news as possible about Africa itself. eNews Africa with some similarities and some unique features, will be a sister service to the eNews Channel - which after just more than a year and a bit on air, is now the MOST WATCHED NEWS SERVICE TV channel on the DStv bouquet. BREAKING. M-Net Action has Stargate Universe. I know when it will start. You're reading it here first. I can break the news first that M-Net Action (DStv 106) has acquired the rights to the Stargate spinoff series Stargate Universe. Stargate Universe will start broadcasting tomorrow in America with a double premiere episode. M-Net Action has confirmed to be that the channel has has picked up the new show (following on in the tradition of Stargate SG-1 and Stargate: Atlantis (currently in it's last few episodes also on M-Net Action). Stargate Universe which follows a brand new crew stranded in a distant galaxy, will start on M-Net Action in January.